Remember that episode of "30 Rock" where James Franco's character was in love with a pillow? Oh that was so funny. You know, because it was a scripted television show. Not real life. 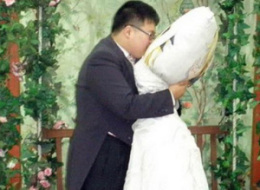 I wouldn't think that would need such a distinction, but then again, I wouldn't expect a man in Korea to marry a pillow. But according to the UK Metro, this is precisely what happened, as Lee Jin-gyu has made a body pillow his bride. If you're dying to see the happy newlyweds in action, here's a look at their day at the amusement park. You must be this crazy to ride the roller coasters.